There are many options out there, but I recommend using the self-hosted blog content system WordPress.org. Although using WordPress.org is a bit more technical, it also allows for the greatest customization, is easy to optimize for search engine rankings, and can be used as both a website and as a blog to keep your content fluid. The WordPress.org software itself is totally FREE; however, you must purchase a hosting account which can host your website/blog. Hosting is fairly inexpensive and averages anywhere from $4 – $10 per month. I use powweb.com for my hosting, and also recommend hostgator.com. There are also hundreds, if not thousands, of FREE or low cost web templates that can be uploaded to your site and customized to make your site unique, and there are also hundreds of useful plugins that can increase the functionality of your site. Unfortunately, there is a wee bit of a learning curve when using WordPress.org, but it is fairly easy to learn and well worth the effort. For those who feel overwhelmed by WordPress.org, I suggest using either Blogger.com or WordPress.com which are both easier to set up and easier to use, but lack WordPress.org’s flexibility and customization. One of the biggest challenges of being a solo entrepreneur is trying to find enough time to get everything done. For writers and authors, there is writing, social networking, platform building, marketing, and a plethora of other things that need to get done. That is why it is so important to learn how to create a marketing and writing schedule that provides time for all of your work activities to be completed. Many authors view writing as their #1 task and spend the majority of their work time doing just that with little to no time spent on marketing and platform building activities. Remember, as an author you are an entrepreneur, and writing is your business! The purpose of any business is to make a profit. To make money you need to make sales. To make sales you must have a product or service available, and you must have effective marketing strategies in place that let the public know about your product or services. Therefore, the two most important activities for any writer or author is product creation and marketing. These two things go hand in hand. 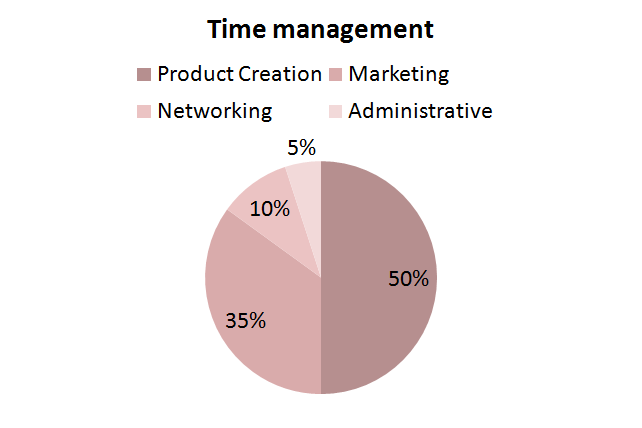 Each author’s goals and needs are different but a good general guideline to follow is to spend 50% of your work time on product creation (ie: novels, classes, speaking engagements, etc. ), 35% on marketing activities,10% on networking, and 5% on routine tasks like checking email, returning phone calls, etc. This of course is just a guideline, and each area can be tweaked based on your individual needs. The most important thing to remember about creating a schedule that works for you is to prioritize your activities giving the most time to those activities that either generate income or lead to income generation. Another important factor is to break each activity down into manageable blocks of time and add these blocks into your daily schedule. This really helps cut down on distractions and prevents you from wasting a lot of your valuable time. As you begin to gauge the results of your marketing efforts, you will begin to see which of your marketing and promotional activities are producing the best results. You can further break down each activity. For example, you may want to divide your time up even further into smaller blocks of time and put more focus on your most successful individual marketing strategies. I recommend using Google Calendar which is an excellent scheduling tool that allows you to color code your scheduled activities according to task type or by priority. You can also download the mobile version of this application so you can have access to your schedule on your mobile device, and can set alarms and alert notifications which will notify you of upcoming individual tasks. By knowing what activities are the most important, and how much time to devote to each one, you will find yourself accomplishing so much more than you would have thought possible.